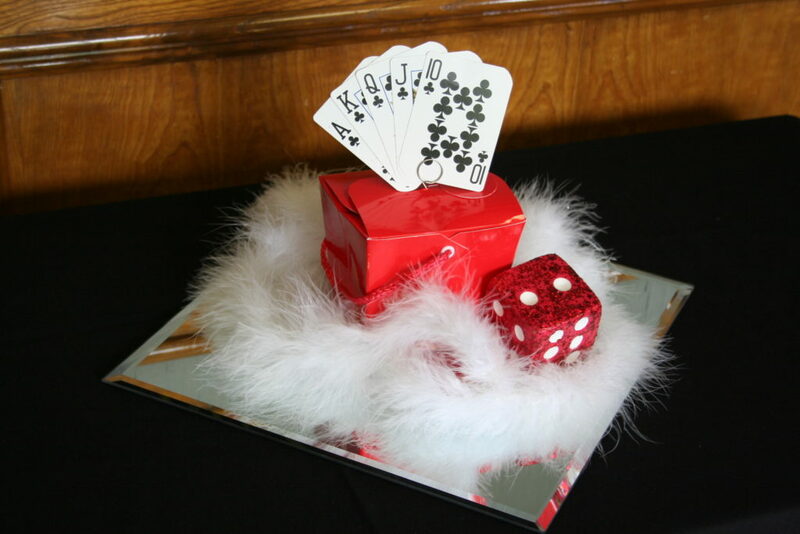 Casino-themed parties are a lot of fun, largely because of all the games guests can play. But there’s another reason people get immersed in the fun – the festive décor! There is so much you can do to dress up a venue with Vegas or casino décor. 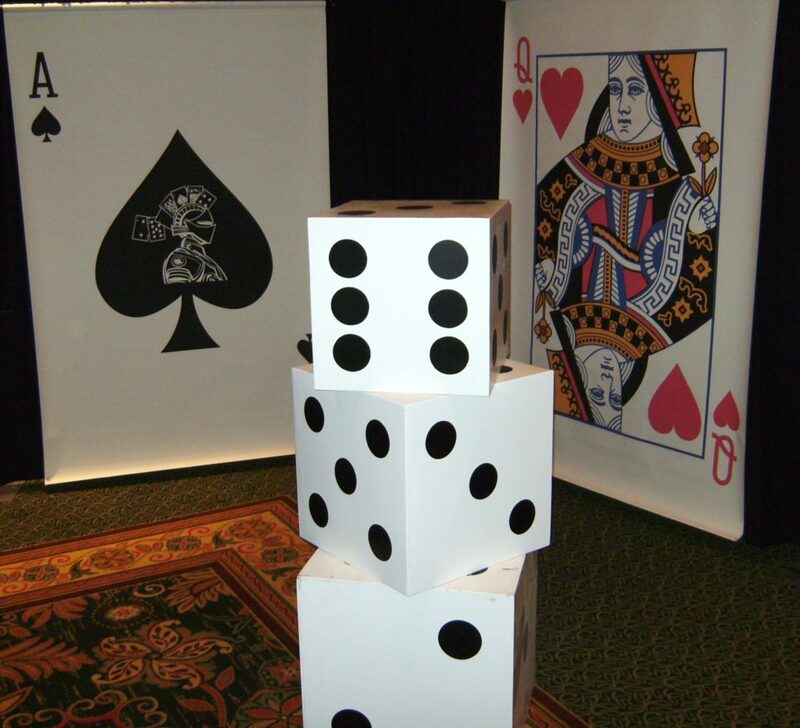 When we throw a casino party our clients can opt to enhance the experience with super-sized decorations like our jumbo dice and 8ft tall card banners. Some clients decide to DIY their decorations as well. 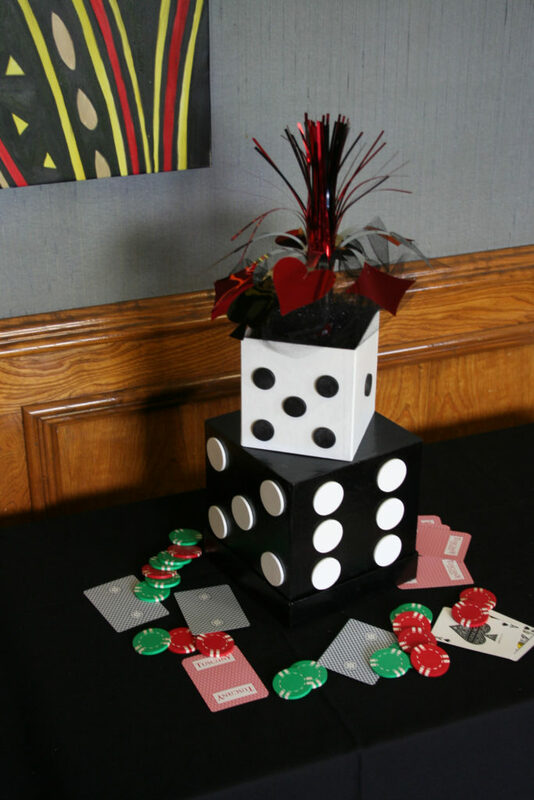 Over the years we’ve come up with a lot of crafty ways to incorporate the casino theme at any venue. Below are some of our best DIY centerpiece ideas that you can easily do on your own for next to nothing! We obviously have a lot of the materials already, but they can also be found in just about any big box décor store. We may even have used cards and poker chips that can be incorporated – just ask and we’ll see what we can do. Chinese takeout containers are cheap, fairly durable and easy to work with when you’re creating DIY décor. You can hide things inside or simply use them as a base for other decorations, which is what we’ve done in the past. Stick in a steel menu/card holder and you’ve already got a great start to your centerpiece. To make things even easier we ordered red Chinese takeout containers online several years ago for a Casino Knights Christmas party. We’ve also seen these same containers at the Container Store and World Market. Once you’ve placed the menu/card holder, position five cards so they are fanned out. Have fun selecting different winning combinations like a full house or straight. Place the container with the cards on a frameless square mirror, then add a few more attractive elements. In addition to cards, chips and confetti, we like to add clear and white glass pebbles like the ones you see in floral arrangements. We’ve even incorporated feather boas from Hobby Lobby in a variety of ways. You can easily make big stacking dice by painting boxes from Hobby Lobby white and gluing on circles of black felt or painted cardboard. You can also use a stencil to paint the dots directly on the box. We like to use boxes with lids because they offer more versatility. Dice can also be made out of empty tissue boxes or wooden containers designed to cover tissue boxes. Stuff your dice with a little black netting, a steel menu/card holder and top it all off with a winning hand of cards! We’ve also had clients use the tissue box dice to hold flowers, which is equally gorgeous. Large card tents couldn’t be easier to create! All you need is a few decks of over-sized playing cards. They come in a variety of sizes and are easy to find online. If you prefer, we can also provide enough large cards to decorate all the tables at your party. Turn two cards so the front (numeral) side is facing outward. Place the top of the cards together to make an inverted V. Tape the top edges together so that they form a stable tent. Surround the tent with dice confetti (from Party City), chips and smaller cards to complete the centerpiece. Throw a festive, fun-filled event that will wow all of your guests with the help of Casino Knights Inc. Our casino fundraisers, corporate events and parties provide entertainment that you won’t find anywhere else in Texas. Give us a call today to discuss how we can make your next event a casino night to remember!